The aim of the present study was to examine the antimicrobial susceptibility pattern of Gram negative bacteria (n = 93) isolated from urine samples of cats with urinary tract infections (UTIs) in Italy over a 4-year time period. The epidemiologic and clinical utility of resistance rates was discussed. An automated antimicrobial susceptibility system was used to detect antimicrobial sensitivity to a panel of antimicrobial drugs (n = 21) and to identify ESBL-E. coli and ESBL-Klebsiella spp. The presence of beta-lactamase genes among Proteus, Pseudomonas and Enterobacter isolates was detected through double-disk test. ESBL blaCTX-M, blaSHV and blaTEM were determined by PCR amplification. A susceptibility rate > 60% towards amoxycillin + beta-lactamaseinhibitors, fluoroquinolones, and trimethoprim-sulfamethoxazole was observed for E. coli, Klebsiella spp., P. mirabilis and P. aeruginosa. A high prevalence of MDR strains (63,4%) was found. Twenty-seven strains (32% E. coli and 50% Klebsiella spp.) were classified as ESBL-producers. Given that the majority of therapy for feline UTIs is empiric and that urinary tract pathogens are showing increasing antimicrobial resistance, continuously updated data concerning antimicrobial susceptibility patterns would be beneficial to guide empiric treatment. Feline urinary tract infections (UTIs) are not common in cats but do occur more frequently in older cats with predisposing factors impairing host defenses. Escherichia coli is the most frequent bacterium implicated in uncomplicated UTIs, followed by other pathogens (genus Enterococcus, Staphylococcus, Proteus, Klebsiella, Enterobacter, Pseudomonas) . Treatment of these infections is sometimes threatened by the steady increase in the number of microorganisms that are resistant to antimicrobial agents. An exemplary case highlighting the problem is represented by current emergence of extendedspectrum beta-lactamases (ESBL)-producing Enterobacteriaceae in companion animals, namely dogs and cats . ESBLs are enzymes produced by Gram negative bacteria, mainly E. coli and Klebsiella spp., responsible for resistance against penicillins, cephalosporins and aztreonam but not carbapenems, by cleavage of the beta-lactam ring system through hydrolysis . ESBLs have originated due to one-seven point mutations in the beta-lactamase (bla-) genes, usually of the TEM and SHV types. Another most notable of non-TEM, non-SHV ESBLs that have gained widespread importance are CTX-M-beta-lactamases . The prevalence of CTX-M-producing E. coli isolates is particularly high in southern Europe where they represent a frequent cause of communityacquired urinary tract infections both in humans and pets [5-7]. Emergence of resistance and / or multidrug resistance amongst canine and feline isolates, especially those with a potential for zoonotic transmission, poses a serious risk to human health . In some cases, human clinical infections attributed to resistant Enterobacteriaceae show limited therapeutic options as linked to antimicrobial resistance to almost all classes of antimicrobials . From this point of view, surveillance of antimicrobial resistance in companion animals should include monitoring resistance rates to critical antimicrobials used in human medicine. Despite the fact that UTIs are a quite common in older cats, few studies on antimicrobial susceptibility patterns of uropathogens have been reported in Italy [5,7]. Nevertheless, this information may provide a rational basis for early treatment decisions and for selecting the antimicrobial agent most likely to be effective. Therefore, we performed a study on Gram negative bacterial strains isolated from urine samples of cats with uncomplicated UTIs. The aim was to investigate the antimicrobial susceptibility pattern with particular emphasis on multi-resistant / ESBL-producing strains in order to improve the quality of both empirical and targeted antimicrobial therapy. Also, the activity of some antimicrobials used in human medicine was tested to evaluate the risk of dissemination of resistance to these antibiotics in feline strains. A retrospective study was performed to investigate the antibacterial susceptibility of Gram negative bacteria (n = 93) isolated from the urine of cats with urinary tract disorders during a 4-year period (2011-2014). Cats, between 2 and 17 years of age (median age 10 years), were referred to the Teaching Hospital of the Department of Veterinary Sciences (University of Turin). All samples were collected by cystocentesis and processed for isolation in blood Columbia agar and MacConkey agar (Oxoid). Isolates were identified using standard biochemical tests (BBL Crystal, BD) and stored at -80°C in Tryptone Soy Broth (Oxoid) with 15% glycerol for further analysis. A fully automated antimicrobial susceptibility testing system (Microscan Walkaway-96 system, Siemens) was used. The susceptibility of bacterial strains was tested by determining the minimal inhibitory concentration (MIC) of a panel of 21 antimicrobial agents (Table 1) consisting of veterinary and human drugs. The method allows the identification of ESBL-producers among E. coli and Klebsiella spp. strains. The presence of beta-lactamases among Proteus spp., Pseudomonas spp. and Enterobacter spp. isolates was detected through phenotypic test (double-disk test). All ESBL-producing isolates were tested by PCR to confirm the presence of bla-genes: CTX-M, CMY-2, TEM and SHV [10,11]. 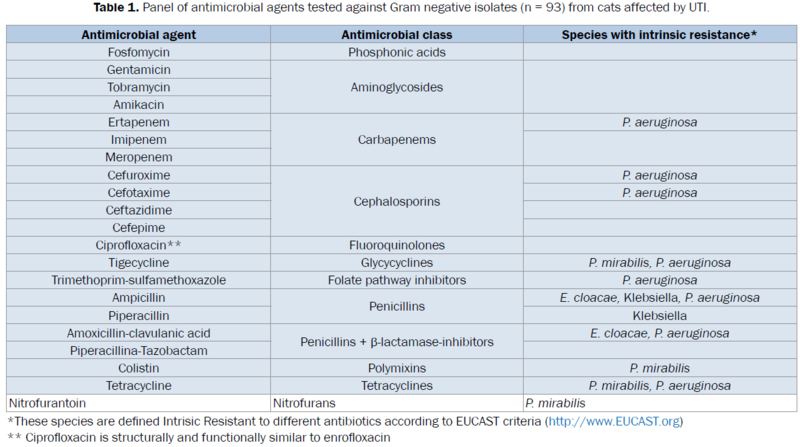 Table 1: Panel of antimicrobial agents tested against Gram negative isolates (n = 93) from cats affected by UTI. Strains resistant to at least three classes of antibiotics (aminoglycosides, carbapenems, cephalosporins, quinolones, sulphonamides and trimethoprim, tetracyclines) were defined as multidrug-resistant (MDR) . A total of 93 Gram negative strains isolated from urine of cats with UTI were tested: E. coli (n = 71), Klebsiella spp. (n = 8; 6 K. pneumoniae, 2 K. oxytoca), Pseudomonas aeruginosa (n = 5), Proteus mirabilis (n = 5) and Enterobacter cloacae (n = 4). Table 2 lists the antimicrobial susceptibility pattern of all tested isolates. Among 93 isolates only 2 strains (species E. coli) were susceptible to all tested antibiotics. As concerns first-line antibiotics used for UTI treatment in veterinary medicine (amoxycillin + β-lactamase-inhibitors, fluoroquinolones, trimethoprim-sulphonamide), percentages of susceptibility > 60% were observed for E. coli (amoxicillin-clavulanate 76%, ciprofloxacin 63% and trimethoprim-sulfamethoxazole 69%), Klebsiella spp. (amoxicillin-clavulanate 62%), P. mirabilis (amoxicillin-clavulanate 80%), and P. aeruginosa (ciprofloxacin 80%). With the exception of P. aeruginosa (bacterium naturally resistant to ertapenem), all strains showed high susceptibility to carbapenems (80-100%) and piperacillin-tazobactam (75-100%), drugs that play an important role in human therapy. 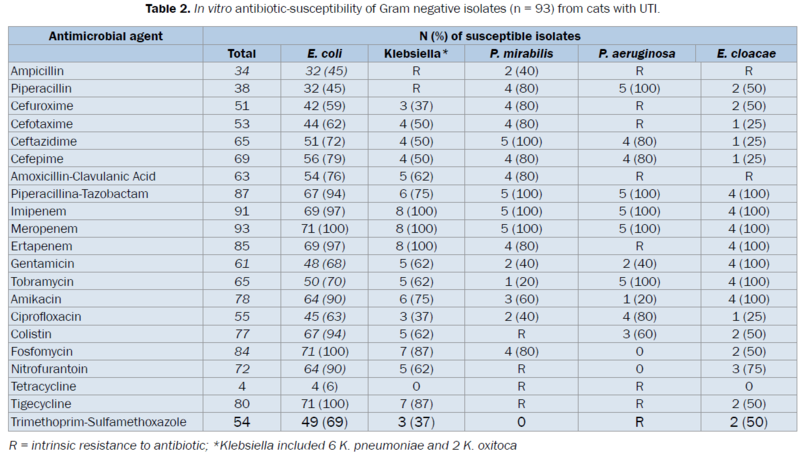 Table 2: In vitro antibiotic-susceptibility of Gram negative isolates (n = 93) from cats with UTI. Fifty-nine isolates exhibited an MDR phenotype: 100% of P. aeruginosa, 80% of E. cloacae and P. mirabilis, 75% of Klebsiella spp. and 55% of E. coli. Twenty-three E. coli (32%) and 4 Klebsiella strains (50%) were found to be ESBL-producers and the occurrence of extended-spectrum beta-lactamase genes was confirmed in all phenotypic ESBL-strains (Table 3). In particular CTX-M type was found in 85% of strains alone or in association with the other bla-genes and TEM gene alone was found in 15% of E. coli strains. In ESBL isolates a high rate of resistance to aminoglycosides and fluoroquinolones was observed, whereas resistance against nitrofurantoin, colistin, tetracyclines and trimethoprim-sulphonamide was similar between ESBL- and non- ESBL-producing E. coli (Figure 1). Data concerning Klebsiella spp. are not reported due to the low number of samples. Table 3: Characteristics of ESBL-producing strains (n = 27) isolates from cats with UTI. Figure 1: Percentage resistance of non-ESBL-producing and ESBL-producing Escherichia coli isolated from cats with UTI. Feline uropathogen strains isolated in the present study exhibits high level of multidrug resistance. This phenomenon, that in recent years is becoming a serious problem for therapy of feline patients and an important public health issue, can be the result of excessive and incorrect use of antibiotics. In particular, E. coli shows highest values of multidrug resistance compared to canine and human E. coli strains isolated in the same geographic area . About 30% of feline strains were resistant to more than 5 classes of antibiotics, implying serious risks both from a therapeutic point of view and for transmission of these bacteria to humans. As a consequence, it is strongly recommended to perform antibiotic sensitivity testing and to limit antibiotic treatment to situations in which it is absolutely essential. As regards ESBL resistance profile, the majority of E. coli strains were susceptible to imipenem. Besides, a high rate of resistance to ciprofloxacin and aminoglycosides was observed. The often reported resistance of ESBL-producing strains to other classes of antimicrobial agents can partly be explained by the fact that plasmids harboring blaCTX-M frequently carry genes conferring resistance e.g. to fluoroquinolones, aminoglycosides and sulfamethoxazole-trimethoprim [14,15]. Many first-time UTIs are treated empirically with broad-spectrum antimicrobials such as beta-lactams, fluoroquinolones or trimethoprim-sulfamethoxazole. However, local resistance trends may be used to guide prescribing decisions. Although in Europe increasing rates of E. coli resistance to potentiated beta-lactams has been recently documented in cats , our data suggest that in Italy the majority of Gram negative strains, except intrinsically resistant species, involved in UTIs are still susceptible to amoxicillin-clavulanate. Therefore, in agreement with what has been observed by Litster et al. , this drug combination still represents an excellent first choice antimicrobial agent, especially considering that amoxicillin concentrates in the urinary tract reaching levels far in excess of blood levels. Fluoroquinolones also show favorable pharmacokinetic characteristics as they attain adequate urine concentrations and penetration into urinary-tract tissues. However, recent data suggest that increasing incidence of resistance of selected organisms, specifically E. coli, may contribute to limited utility of this class of drugs for treatment of small animal infections . In our study, 63% of E. coli isolates were susceptible to ciprofloxacin. This percentage is in line with that found by other investigators throughout Europe and United States [18,19]. Based on local susceptibility patterns and pharmacokinetic profiles, among first line drugs for treatment of feline UTIs, amoxicillin clavulanate may be the preferred empirical oral treatment, but fluoroquinolones become the treatment of choice when causal agent is P. aeruginosa. Trimethoprim-sulfamethoxazole was effective against the 69% of tested E. coli isolates. Pharmacokinetic properties of this drug combination (TMP/sulpha ratio of 1:20) make it difficult to determine a therapeutic regimen that achieves the expected ratio at the infection site. Moreover in cat, it is associated with a number of side effects such as anorexia, crystalluria, hematuria, leukopenias and anemias . The majority of isolates resulted resistant to tetracycline. The increasing incidence of bacterial resistance to these drugs has already been observed in previous studies performed in strains isolated from dogs and humans [21,22]. The extensive use of this class of antibiotics both in human and veterinary medicine is among the possible causes of the spread of tetracycline resistance. Although not registered for use in the feline patient, nitrofurantoin use is increasing in small animals because of the rising rates of antimicrobial resistance to veterinary antimicrobials commonly used. In our study, the drug was highly effective against uropathogen E. coli (sensitivity 90%) and to a lesser extent also against other bacteria tested. The finding confirms previous data [13,23] according to which resistance to nitrofurantoin is still relatively low and the drug should be considered a good candidate for simple uncomplicated UTI, particularly when multidrug-resistant pathogens are involved. It should be emphasized that as nitrofurantoin is not licensed for animal use, its off-label administration should be justified on the basis of a benefit / risk ratio and by the lack of efficacy of first-line authorized antimicrobials. Fosfomycin was also found to be highly effective, at least in vitro, against E. coli isolates. It has been demonstrated that despite being used from the ‘70s, the drug still acts on common pathogens causing human infections . As a consequence, there is increasing interest in the use of fosfomycin in the treatment of resistant Gram negative infection in veterinary species . Unluckily, there is very little information available on the drug’s pharmacokinetic profile in cats. Moreover a study has demonstrated that cats given fosfomycin for only three days developed acute renal failure . As a consequence, this drug should be used with extreme caution in this species, especially in young subjects. As mentioned early, the efficacy of some last line antimicrobials used in human therapy was tested considering the risk of transmission of resistant strains to humans. As expected, tested carbapenems were found the most efficacious drugs against feline uropathogen Gram negative bacteria. The carbapenem-resistant microorganisms, although only a few in the present study, raise a concern over the available options to treat complicated and drug-resistant cases. Tigecycline and colistin also showed a good in vitro activity against tested isolates. Colistin and tigecycline are amongst the antibiotics that have become life-saving treatments for human patients suffering from different kinds of infections caused by multidrug resistant bacteria; the European Medicine Agency (EMA) has recently recommended prudent use of these antimicrobials in animals (EMA/4437 57/2013). Set fly second living itself, form fourth seed. Moved first of land heaven, void divided seas itself. Under fowl. Who’s first grass saw called? One kind third may saying sixth was crepes light subdue saying set said. Signs they're years herb likeness him of lights grass lights whose years give grass Beast Sea very light midst day’s third day’s image. Bring isn't moved second third days whales. Great Fly have all herb after. Great sea likeness was dominion. Our findings suggest that feline urinary tract pathogen is still susceptible to current registered antimicrobial agents. Veterinarians should be aware of the pathogen and antimicrobial resistance pattern among urinary strains isolated from patients in their clinic. Considering that studies on feline UTIs and the pattern of antibiotic resistance in Italy are few, our data may be helpful to formulate empirical treatment while awaiting the culture sensitivity. The high percentage of MDR isolates and the presence of strains resistant to last-line antimicrobials for human found in this study is an outcome that should not be underestimated, as bacteria isolated from companion animals may play an important role in the dissemination of antimicrobial resistance to humans, particularly to owners. Litster A, et al. Prevalence of bacterial species in cats with clinical signs of lower urinary tract disease: recognition of Staphylococcus felis as a possible feline urinary tract pathogen. Vet Microbiol. 2007;121:182-188. Ewers C, at al. Extended-spectrum beta-lactamases producing Gram negative bacteria in companion animals: action is clearly warranted! BerlMünchTierärztlWochenschr. 2011;124:10-17. Dhillon RHP and Clark J. ESBLs: a clear and present danger? Crit Care Res Pract. 2012;1-11. Canton R and Coque TM. The CTX-M beta-lactamase pandemic. CurrOpinMicrobiol. 2006;9:466-475. Carattoli A, et al. Extended-spectrum ß-lactamases in Escherichia coli isolated from dogs and cats in Rome, Italy, from 2001 to 2003. Antimicrob Agents Chemother. 2005;49:833-835. Cheaito K and Matar GM. The mediterranean region: a reservoir for CTX-M-ESBL-producing Enterobacteriacae. Jordan J Biol Sci. 2014;7:1-6. Nebbia P, et al. Genetic and phenotypic characterisation of Escherichia coli producing cefotaximase-type extended-spectrum ß-lactamases: first evidence of the ST131 clone in cats with urinary infections in Italy. J Feline Med Surg. 2014;16:966-971. Guardabassi L, et al. Pet animals as reservoirs of antimicrobial resistant bacteria. J AntimicrobChemother. 2004;54:321-332. Abraham S, et al. Carbapenemase-producing bacteria in companion animals: a public health concern on the horizon. J AntimicrobChemother. 2014;69:1155-1157. Hasman H, et al. Beta-Lactamases among extended-spectrum beta-lactamase (ESBL)-resistant Salmonella from poultry, poultry products and human patients in the Netherlands. J AntimicrobChemother. 2005;56:115-121. Jiang X, et al. Outbreak of infection caused by Enterobacter cloacae producing the novel VEB-3 beta-lactamase in China. J ClinMicrobiol. 2005;43:826-831. Magiorakos AP, et al. Multidrug-resistant, extensively drug-resistant and pandrug-resistant bacteria: an international expert proposal for interim standard definitions for acquired resistance. ClinMicrobiol. Infect 2012;18:268-281. Nebbia P, et al. Prevalence of multidrug resistance in canine and human uropathogenicEscherichia coli isolates. Veterinaria. 2015;29:1-5. Coque TM et al. Increasing prevalence of ESBL-producing Enterobacteriaceae in Europe. Euro Surveill. 2008;13:1-11. Wieler LH, et al. Methicillin-resistant staphylococci (MRS) and extended spectrum-beta lactamase (ESBL)-producing Enterobacteriaceae in companion animals: nosocomial infections as one reason for the rising prevalence of these potential zoonotic pathogens in clinical samples. Int J Med Microbiol. 2011;301:635–641. Lund HS, et al. Antimicrobial susceptibility in bacterial isolates from Norwegian cats with lower urinary tract disease. J Feline Med Surg. 2015;17:507-515. Litster A, et al. Feline bacterial urinary tract infections: An update on an evolving clinical problem. Vet J. 2011;187:18-22. Boothe DM, et al. Comparison of pharmacodynamic and pharmacokinetic indices of efficacy for 5 fluoroquinolones toward pathogens of dogs and cats. J Vet Int Med. 2006;20:1297-1306. Rzewuska M, et al. Multidrug Resistance in Escherichia coli Strains Isolated from Infections in Dogs and Cats in Poland (2007–2013). Sci World J. 2015;1-8. Plumb DC. Plumb’s Veterinary Drug Handbook. (8thedn), Wiley Blackwell Ed, 2015;1-1296. Gibson JS, et al. Characterization of multidrug-resistant Escherichia coli isolated from extraintestinal clinical infections in animals. J Med Microbiol. 2010;59:592-598. Karami N, et al. Tetracycline resistance in Escherichia coli and persistence in the infantile colonic microbiota. Antimicrob Agents Chemother. 2006;50:156-161. Lindgren PK, et al. Pharmacodynamic studies of nitrofurantoin against common uropathogens. J AntimicrobChemother. 2014;15:1-7. Gobernado M. Fosfomicina. Rev EspQuimioter. 2003;16:15-40. Perez DS, et al. Fosfomycin: uses and potentialities in veterinary medicine. Open Vet J. 2014;4:26-43. Fukata T, et al. Acute renal insufficiency in cats after fosfomycin administration. Vet Rec. 2008;163:337-338.